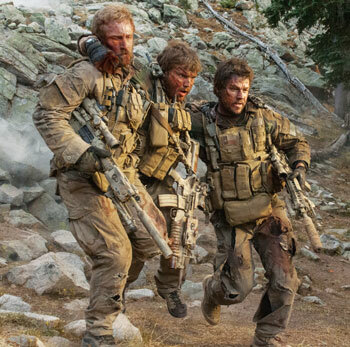 Recently the trailer for the movie, “Lone Survivor” has created quite a bit of buzz in the airsoft world. It really does look like an intense flick with some well-done special effects, a cool story line and sweet gear. Like many players, I see some great movies and either want to be as cool as the character or just have the impressive stuff they have. Movies like “Black Hawk Down” and “Zero Dark Thirty” have encouraged a huge number of players to re-create the movies and even create kits based on the video games. The movie, “Lone Survivor,” is based on a real life event which was recounted in a book written by Marcus Luttrell and Patrick Robinson. Luttrell, a US Navy SEAL, was a part of a mission that resulted in a major loss of life to SEAL Team 10 during operation Red Wings in Afghanistan on June 28, 2005. Originally meant to be a scouting mission to find Taliban leader, Ahmad Shah, the team was discovered by a goat herder and his son. The four-man SEAL team decided to let them go. The two immediately ran to the Taliban and alerted them of their position. Suddenly, the team was under attack from high ground by a much larger Taliban force. In a long fight, three of the four SEALs unfortunately perished after one of the bravest fights in history. Luttrell was able to make it to a local village with the assistance of some anti-Taliban villagers. He was there for a few days before being picked up by a U.S. military rescue team. Luttrell’s main goal after this was to get the story out about the actions of the brave men he fought with on that mission to ensure that they would be remembered. 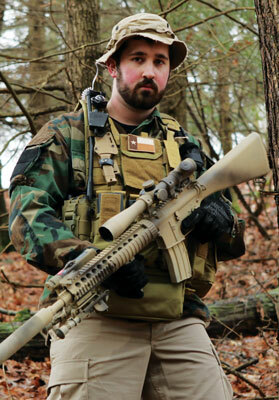 I chose to base my kit off of Marcus Luttrell’s. It was a little different than some I had seen and includes one of my favorite rifles, the MK12 Mod 1. I was curious to see just how well a loadout from a movie would work in game. How practical would it be? How much would it cost? Would anyone recognize it? The following are the steps I took to build the entire kit. I’ve broken it down into sections: the rifle, the uniform, the vest and accessories. After careful review of the rifle carried by Luttrell in the movie, I have determined it to be a SPR Mk12 Mod 1. The SPR or Special Purpose Rifle is based on an M4 platform. The model in the movie has a solid stock, free-fl oat Knight’s Armament rail, Harris Bipod, an SPR suppressor, Peq 2, and an Mk3 scope. There are a few airsoft variants made. The G&P model is very close to the one from the movie as well as the Dboys version. I opted to use the Dboys version for its lower cost and it already came with the bipod. Airsplat.com gave me the hookup on this rifle. A couple of subtle differences between the one in the movie and the Dboys were the pistol grip and gas block. The rifle in the movie had a low profile gas block, not the flip-up that the Dboys comes with. I was able to pick up a Noveske block from a local swap meet. Since it will be painted the logo doesn’t matter. Next was the pistol grip. The Dboys comes with a unique grip but not the standard M4 type I needed. Luckily I had one on hand in my collection to throw onto this rifle. The suppressor I used is a King Arms model. It is unique for this style of gun because it threads over the SPR fl ash-hider. The Dboys Peq 2 battery box is a great stand-in for a real Peq box and it is much cheaper. G&P does make a replica Peq 2 but I have had a hard time tracking them down. The scope used was an M3 replica that I had found on eHobby Asia. Finally, the paint used on this Krylon camo paint in khaki (tan) and brown. Luttrell’s Rifle was set up for longer precision shots. This is quite the setup and build. The overall length with the suppressor attached is pretty long but this isn’t a huge problem. It is a fairly light rifle even though it is full metal construction. In woodland type environments it’s not too bad but in my opinion it’s too long for CQB. My overall cost for the rifle was just over $367. In the movie, Luttrell’s character, played by Mark Wahlberg, wears an interesting ensemble. Starting at the head and working your way down you will see his Tan boonie hat, woodland jacket, black gloves, tan pants and tan boots. The tan boonie cap is a good lightweight alternative to a helmet, offering cover from sunlight all around the head. You will also notice that he had trimmed the brim of the hat to cut down on size. 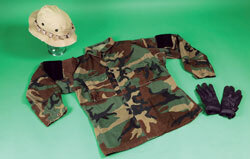 Next up, the woodland BDU top used is an older style that has been raid modded. Put simply, you take the older standard four pocket BDU top, strip the two lower pockets and place them on the shoulders at a slight forward angle. Then simply add Velcro and you are good to go. This was the precursor to the modern style tactical shirts that feature these pockets standard. The slight angle makes it a bit easier to remove items from the pocket and having the buttons makes it quieter as well. 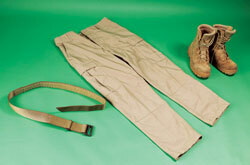 The pants don’t look like anything too special; a simple pair of solid tan BDU-style pants. The choice of solid tan over a tricolor desert is beyond me. The boots look to be the standard military cut in the desert tan version. There weren’t too many close-ups on those to nail down a brand or height on the boot. The uniform is pretty basic. As stated I’m not entirely sure why solid colors were used over camo patterns but it makes for a unique look. All of these items can be had fairly cheap. If bought new the total cost would be $160. The rig or vest is an RRV. The real one was more than likely an Eagle Industries Model. I opted to use Pantac for mine. Pantac makes high quality gear at a very reasonable rate. The RRV is a very versatile setup. 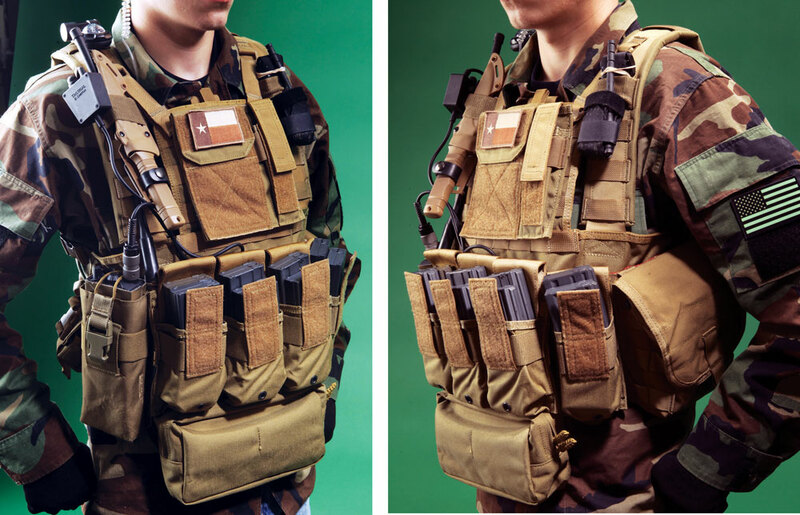 It can be used in its standard form or you can fold the bib down to create more of a chest rig. You can add a front plate as well as a rear back panel to hold a plate. They also make a special hydration pouch for the rear. 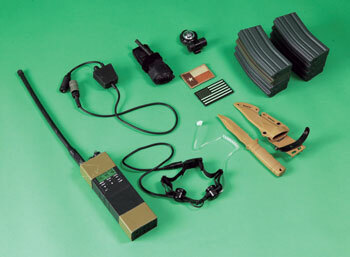 In the movie it is in its standard form to allow the use of a three-day assault pack. Next, I had to identify the pouches used on this rig. First, there is an Admin Pouch. Used to hold small maps and papers, it has a pocket on the side that can hold a pistol mag, multi-tool or small flashlight. Moving down, we have an MBITR radio pouch. This is for the larger hand-held radio units and it has a single buckle closure on the front to strap the radio down in the pouch. Next we have four double M4 magazine pouches. Each one can hold two mags, giving you a total of eight as well as one in the gun. These are the standard closed top type; however, Luttrell/Wahlberg has the closing flap folded in behind the magazines for easier access. There is a dump pouch on his left side that can be used to hold empty magazines or anything else that can fi t in there. On his right side there is a frag pouch for a grenade. This pouch, although small, is imperative for the loadout. In the book and movie Marcus pulls the grenade from the pouch to keep the locals from coming closer since he is not sure if they will be friendly or not. It was a last ditch option but certainly left an impression. Finally, there is a long, horizontal, general-purpose pouch hanging from the bottom center of the rig. This pouch has a zipper closure and can hold anything you need. In game, this would be BBs gas, red rags or whatever your needs may be. I like this setup. It was just about everything I might need. The one major item missing is hydration. Without the large, three-day pack you do not have a hydration bladder. You can, however, add a canteen to the dump pouch or a water bottle to the horizontal GP pouch. You have plenty of ammo with eight magazines on the vest. You can also carry the needed comms and a grenade such as a pea grenade. I used Pantac for all the pouches with the exception of the dump pouch. That was a Condor one. When bought new the total would be $257. You will notice little odds and ends on the rig and uniform. It took a while to figure out exactly what was worn throughout the movie. Starting with the Communications setup, he has a PRC 148 radio with a TEA PTT. I used the Toy Soldier replica five-pin radio. They cost a bit more than the typical Motorola Talkabout radios but this looks far better. The next noticeable accessory is the knife. It is an M 37 SEAL pup knife. I was able to find a TMC replica of it at a reasonable price with the tan finish. Next we have the tourniquet on the left shoulder of the rig, the simple black version, I used a TMC C-A-T tourniquet and it is pretty spot-on for looks. I used two rubber bands to fasten it to the rig. On the opposite shoulder there is a VIP strobe for IR use. I used the functional element version. As for the mags, I used a box of mag mid caps in the standard style. I got a box of eight and purchased one separately. For game play I used a pea grenade but for the photos I had a dummy grenade. Last but not least are the patches. In the flick he wears an OD IR reflective patch as well as a Texas patch. If you read the book you know Luttrell is a proud Texan. All of these items really complete the look of the setup. The total cost on these was $300. So now it’s game day. Time to kit up and hit the field to see how practical this setup really is. Is it all show and no go? We ran the setup without the three-day pack, since it was only a one-day skirmish. This time of year there isn’t much for foliage in our area other than the evergreens and some bushes here or there. I tried to use the woodland camo to my advantage and stick to the bushes; however, the tan hat and pants didn’t blend so well. In lighter areas I had the reverse effect so I had a difficult time blending into my surroundings. Overall the weight wasn’t too bad and I had very good maneuverability. Since I was wearing everything on the front it was a bit front-heavy but with the straps on the vest the weight was distributed fairly well. I had plenty of ammo on me. My typical carry is four to six mid-cap magazines so nine was more than enough for me. I was also able to carry spare batteries, BBs, speed loader, red rag and field map. I put a water bottle in the horizontal general purpose pouch. As for the rifle, it performed fairly well. Since it was a stock Dboys it was chronoing 355-360 with .20. The setup certainly turned a few heads. It was a sleek, long rifle with a nice paint job. Many people asked what it was. It wasn’t too bad to maneuver in the woods, despite its large size. This setup made for a good day of play. If you used it a few more times you could be just as proficient as anyone else on the field. The final cost to get it all together was $1,090. Since this was a full loadout the price may seem a bit high to those not familiar with the hobby. You can certainly get into this on the cheap but if you get the things you really want it certainly adds up. Looking through the “Used for Sale” sections and finding local players who may be selling these items can always bring the price down. Shop around and find what you want. Don’t settle for less. The Lone Survivor Foundation provides support for our wounded service members, their spouses, children, and caregiver(s) by empowering them with helpful techniques and tools addressing Post Traumatic Stress Disorder (PTSD), Traumatic Brain Injury (mTBI), sexual trauma and pain management. The Lone Survivor Foundation restores, empowers, and renews hope for our wounded service members and their families. Most airsoft players have a certain amount of admiration of people in the military who put themselves into harm’s way for us and for those alongside them. It has been said that imitation is the sincerest form of flattery, but there is a line that should not be crossed. Wearing the same camo pattern, vest, helmet and getup as a real world member is O.K. However, wearing the rank, branch or unit patch that you did not earn is forbidden in my book. Please be respectful, help our great sport be seen in a good light and do not misrepresent something that you did not earn. There is a reason why there are so few Tridents, Green Berets and MARSOC patches awarded. They are earned by those who are willing to go further than a lot of “chairsofting” couch potatoes out there. 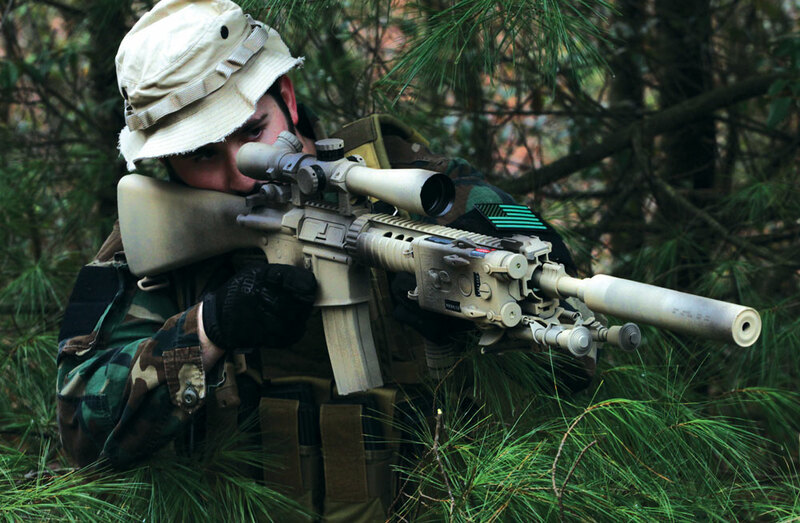 Hopefully this has inspired you to create a loadout based on a movie, book or video game. It can certainly add up depending on what you decide to go with but it is also very rewarding when it can be pointed out at the fi eld. 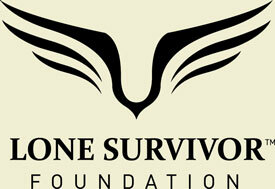 Please also take the time to check out the Lone Survivor Foundation and consider making a donation.